The following article originally appeared July 11, 1993 in the magazine section of the Fort Lauderdale Sun-Sentinel Sunday Newspaper. The writer of the article, Jonathan King, said that he was planning to do a story about the local Pawnbroker Industry. After conducting interviews with a number of pawnshops, he returned and informed us that he had decided to write the ENTIRE article about our business EXCLUSIVELY! can turn a retread into a deal. HAL SABRA, 67, HAS DONE IT right for three decades. in Fort Lauderdale and coaxed Hal down from New York to join him. Exchange, they ran one of only three pawnbrokers in the city at the time. 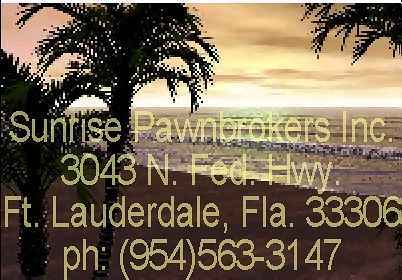 Today there are 70 pawnshops listed in the Fort Lauderdale phone book. There are only 56 different banks listed in the same directory. credit or want to borrow a small amount of money,`` says Steve Sabra. ``Have you gone into a bank lately and tried to borrow $50 or $100? neck of some cherished citizen or Third World dictator. guarded by a thick, wire-mesh barrier. pawnbroking in the real world. few customers who are well off,`` says Hal. gold jewelry and praises the percentage rate. loan and use the watch as collateral. will be if you don`t come back to reclaim it. expect much of a loan. conversation and a lifetime behind the counter. say they always advise customers to borrow only what they need. Ninety percent of what is brought in for collateral is eventually returned. The rest is laid out for sale. The Sabras` repeat customers are legendary. take the six months, it`s five percent each month. month or less. If you wait the entire six months, you pay $300. watched over a dozen stores. Now he deals with 60.
trying to tempt you all the time, but it`s just not worth it to us. Still, the Sabras do take weapons as collateral. ``I know a great deal about guns, but I`ve never fired one,`` Mark says. Yet firearms are not the most uncomfortable items to deal with. items they`re attached to emotionally,`` says Mark. bands, family heirlooms and personal momentos. Sabras agree to show it only if the fighter`s name is not revealed. for her son,`` says Mark. and carries away her tiny collection until the next crisis. PAWNSHOPS ARE NOT ALWAYS KNOWN for their benevolence. Yet the original business of pawnbroking was fair by decree. influence as merchants and bankers. ``But every day is an adventure. It never gets boring,`` says Steve. irregularities of the economy and the customers. it`s just the opposite,`` says Hal. Human nature shows itself in odd fashion at a pawnshop. heavy gold chain as a collar for his dog. Dealing with first-timers is always a challenge. there`s a good pawnshop in town.